If you won a book, please email me your mailing address at comments(at)melaniedobson.com, and I'll send a copy right out. If you didn't win a book, I will be posting the links in the upcoming weeks of other bloggers who will be giving away copies of it as well. Thanks again! Happy summer reading!! 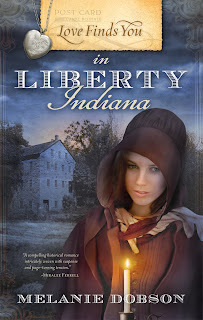 I'm so excited to announce the release of my first historical novel, Love Finds You in Liberty, Indiana. This story has been brewing inside me for decades so it was an absolute delight and blessing to be able to write it. The book is about a Quaker woman in Liberty who risks everything to hide runaway slaves on the Underground Railroad and a young newspaper editor who fights for these same runaways with his pen. During my trip to Liberty, I visited a number of old homes that were once stations along the Underground Railroad, and I loved learning the real-life stories about the courageous men and women who escaped slavery and/or fought for freedom. On June 24th, I will be drawing five names to receive a free copy of this book. If you'd like to be included in this drawing, please leave a quick comment below. I will post the names of the winners on June 25th and mail the books off by the end of the month. Early this morning I sent in my manuscript for the second book I've written this year (a contemporary romantic suspense story called Crescent Hill). I haven't had much time to blog the past few months, but that's because I've been writing, writing, writing. The same day Crescent Hill was due marked the official release date of my first historical romance novel (Love Finds You in Liberty, Indiana). I'm so excited about this book, and once my brain recovers from lack of sleep (let's hope it recovers soon... :), I'll be giving away several copies of this book on my blog. A week or so ago, I also signed a new contract with Summerside Press who does the Love Finds You series. I will be writing three novels for them in the next two years. I've loved working with this publisher, and it is such an honor for me to be partnering with them for three more books. So I'll be traveling to the village towns of Homestead, Iowa and Harmony, Minnesota this summer and come the end of November, I will have finished Novel #3 for the year. So, I haven't had much time to blog, but for those of you who keep checking in, thank you! I will post the give-away for the Liberty book this week and some summer pictures soon.